My essay “1833 – 1932: American Literature’s Other Scripts,” included in Cody Marrs and Christopher Hager’s edited volume Timelines of American Literature (Johns Hopkins UP), emerged out of my research on Helen Keller’s theory of embodied selfhood (“Stillness Is a Move: Helen Keller and the Kinaesthetics of Autobiography” in American Literary History, Fall 2013). Building on Marta Werner’s materialist recuperation of Keller’s writing practices as well as Mara Mill’s powerful work on the disability history of modern communications, I explored how Keller’s engagement with Braille troubles ocular-centric notions of subject and object, of self and other, of the real and the representational – and of authorship itself. 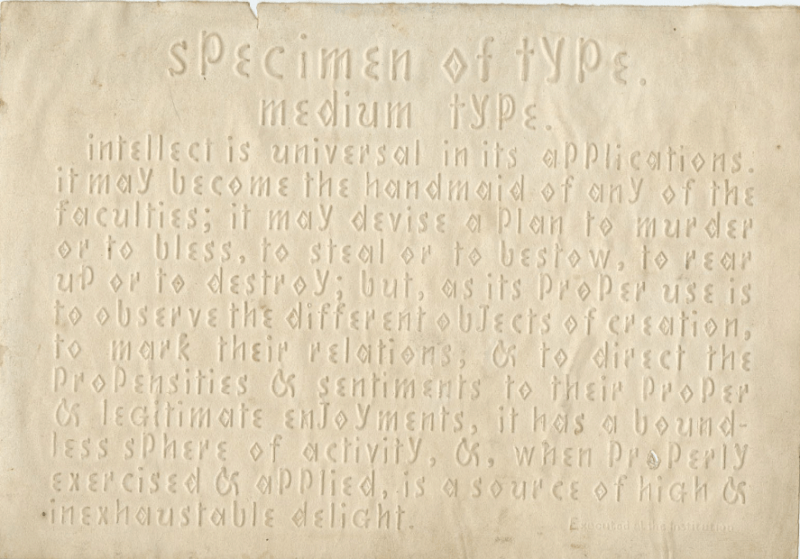 This exploration was based on the assumption that Braille was the tactile print system in which Keller read and wrote. I was wrong. Unfolding in the decades prior to and during her first decade as a writer was a little-known but widespread public debate called “The War of the Dots.” Unlike most wars in the U.S., this was not a territorial but a typographical one. In 1786, French educator Valentine Haüy created raised, three-dimensional letters to be read with the fingers. Forty years later, the blind French educator Louis Braille published his raised print system, but replaced Haüy’s alphabetic characters with dots – each set representing an alphabetic letter – which he argued made reading easier and quicker for those with visual impairments. So began the war between “line type” (raised alphabetic characters) and “point type” (raised dots). The war spread to the United States in the 1830s, where social reformer Samuel Gridley Howe devised his own type (“Boston Line Letter”), as did Philadelphia printer Napoleon Kneass (“Philadelphia Line Letter”), among others. The proliferation of raised print systems – some line, some point – was burdensome for the people these institutions were professing to help. To read any given book required literacy in any number of print types. After almost a century of activism by blind students and their teachers, Braille finally “triumphed” – but that was far from a foregone conclusion when Louis Braille first invented it. My essay explores the economic and ideological factors driving this war, but equally if not more important it recovers readers and writers who have been largely excised from book history and print culture. When in 1832 Philadelphian Jacob Snider printed the first embossed book in the U.S., The Gospel According to St. Mark, that event inaugurated not simply a debate between social reformers – over whether or not point type would undermine assimilation – but made possible an entirely new and highly decentralized reading public. As my essay argues, what emerged from the war was a literary “para-canon” altogether different from the one taught to sighted people as well as a mixed-media “sub-canon” in which blind writers repurposed inkprint literature. Within this framework, Keller’s authorship no longer seems exceptional but instead part of a larger and more dynamic literary culture. The goal, then, of my essay is not simply to treat tactile print (and its users) as an object of recovery but as an analytic. After all, what if we were to model our “timelines” of U.S. literature not on the straight-and-narrow path of ocular reading (left to right, left to right) but on the radial trajectory of the haptic, fingers moving both with and away from each other, looping back yet ever outward?